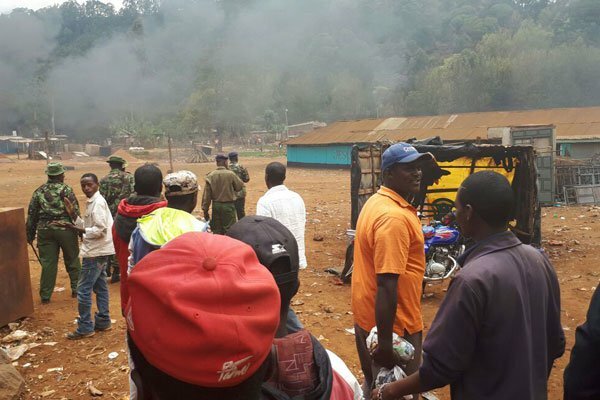 Raila Odinga’s rally in Laare, Meru County, has been cancelled after Jubilee and Nasa supporters clashed. ODM communications director Philip Etale had confirmed that Mr Odinga and other National Super Alliance (Nasa) leaders would be in Meru for their “no reforms, no elections” campaign. Tension ran high throughout the day as Jubilee and Nasa supporters clashed ahead of the rally. Youth chanting Jubilee slogans lit bonfires at the entrance of Laare coffee factory grounds where the meeting was to be held. Their Nasa rivals attempted to push them out, leading to a rock-pelting match that lasted for hours. Police officers used teargas to disperse the increasing number of pro-Jubilee youths who kept surging towards the venue of the rally. However, at 2pm, it became clear the rally had been cancelled after organisers started removing tents, chairs and the red carpet from the grounds. Meru County ODM chairman Robert Kathata said the rally had been called off since Mr Odinga and other Nasa principals could not fly due to bad weather. “We will announce another date for our rally. However, we maintain that there will be no elections on October 26,” Mr Kathata said. Mr Odinga and other principals were expected to address the rally in the afternoon. Trouble started at dawn on Tuesday after unknown people lit bonfires and burnt a wooden dais at the venue. As Nasa supporters prepared the rally venue, pro-Jubilee youth started arriving in vehicles, brandished Jubilee placards. The two camps threw stones at each other before six police officers arrived to restore calm. Addressing the Nasa supporters under the watch of anti-riot police, Lawyer Kirimi Mbogo said the opposition would not be deterred by intimidation from Jubilee. “We ask the Jubilee supporters to respect the opposition in Meru. We are peace lovers and urge the police to ensure we enjoy our constitutional rights. We are ready to rescue this country from bad leadership,” Mr Mbogo said. He urged the youth to desist from being used by politicians to cause chaos at political meetings. The Meru Nasa leaders said they would continue to support the opposition’s agenda against the October 26 election. The aborted Nasa rally came a few days after ex-ODM point man Mike Makarina defected to Jubilee Party and accused the opposition of plotting to cause chaos in the country. Jubilee leaders maintained that Nasa support has been weakened following the reunion of Meru leaders who joined President Kenyatta in his campaigns a week ago. Mr John Nkari, a Nasa official in Meru, said they were keen to boost Nasa support in the region, especially in resisting the repeat election. Nasa coordinator in Meru Joseph Mung’athia said those who defected have always been pro-Jubilee. However, addressing journalists in Meru town, Mr Makarina who defected to Jubilee said the Nasa principals were welcome in Meru, but their message on boycotting elections was unwelcome. He accused Nasa of failing to pay more than 3,700 election agents in Meru, saying Mr Odinga was welcome to address the issue. “Mr Odinga is welcome to come and say when the agents who took care of his votes in Meru will be paid. The people of Meru are not ready to demonstrate hence Nasa has no following in the county,” Mr Makarina said. During their campaigns in Meru, President Kenyatta and his deputy William Ruto concentrated their rallies in Nyambene region where Mr Odinga got a majority of votes in the annulled election. In the August 8 election, Mr Odinga garnered 55,000 votes in Meru County up from the 32,000 votes he got in 2013.